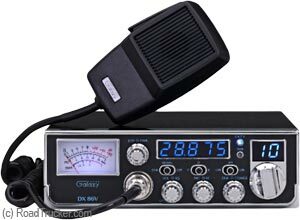 Introducing the New Galaxy DX86V mid-size 10 meter radio for 2017. Comes with Dual Mosfet Transistors and will fit on those tight compartments in big trucks with smaller chassis. The "Mini-Gal" DX86V offers AM/SSB, but no PA or FM. It features 5 digit frequency counter, blue channel display, high SWR LED Indicator, bright/dim, and many more. Please Note: There are No Returns or Exchanges on Galaxy 10 Meter Radios by RoadTrucker® or the Distributor. You Must Contact Galaxy Directly as they warranty their 10 meter radios for 2 full Years.